There are several good reasons for organising a systematic county-wide survey to add to what knowledge we have. The new project will aim to identify as many species as possible in the surveyed woods, so enabling us to compare bat communities between sites and perhaps even guess at why they differ and what can be done to enhance habitats. Some woodland bat communities may be of particular interest because of their location. 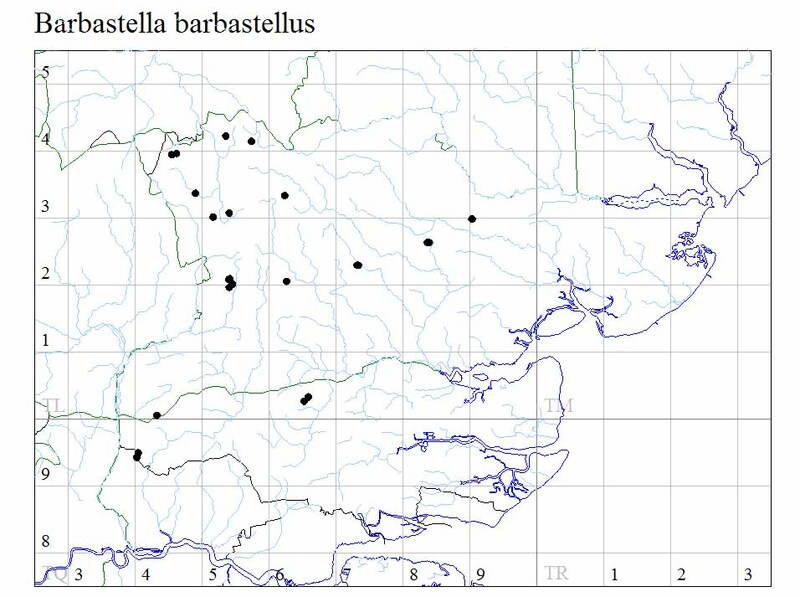 For example, we might wonder which species occur in isolated woods, such as the cluster of sites between Rayleigh and Leigh-on-Sea, which are largely surrounded by built-up areas. We know we have noctule here. At the other end of the county, Stour Wood and Copperas Wood sit on the estuary of the River Stour, with trees lining the upper shore above tidal mudflats and scraps of saltmarsh. It is highly likely that bats forage at this inter-section of habitats and it would be interesting to confirm this using static detectors. 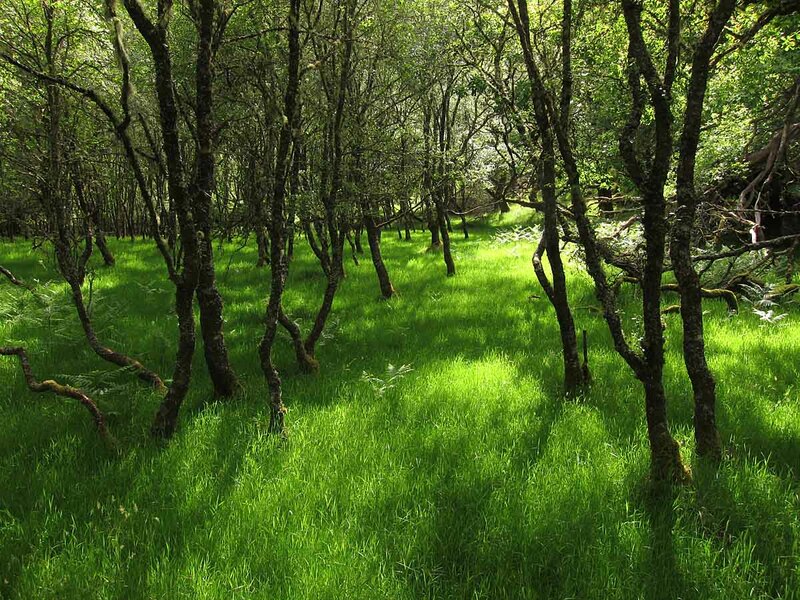 Intensive woodland surveys may also provide our best chance of locating unknown populations of certain species for which we have no reliable modern records, but which might be expected (or hoped!) to occur in Essex. These are the bats known collectively as ‘small Myotis’ or WAB’s – whiskered, Alcathoe and Brandt’s bats. There are a few records of whiskered/Brandt’s from neighbouring counties and Alcathoe bat was only recently discovered to be resident in Britain. To confirm the presence of any of these species in Essex would be a fantastic result. The Committee has set up a Sub-Group to plan the new project. There is a lot to think about and a lot of planning to be done if we are to make the most of our woodland study. We have to decide on survey protocols, methods, aims, objectives and priorities. We also have to be realistic in assessing timescales and the availability of volunteers, bearing in mind that this will be an additional project to several the Bat Group is currently engaged in. Static detectors will be our primary means of gathering records and the progress of the project will depend largely on the availability of volunteers to deploy and retrieve the machines, move them around the county and analyse the recordings. Inevitably we will generate very significant amounts of recorded bat echolocation and social calls. Increasingly these can be used to make confident identification. However, it is likely that to confirm the presence of cryptic Myotis species we will need to supplement acoustic surveys with trapping sessions. This would require an application to Natural England for a project-specific licence and an additional level of volunteer involvement. Rather than adopt any particular protocol from the outset and to avoid prejudging the most effective methodology, we intend to start with a short-term objective. This will ensure that the project delivers valuable results during the time we are familiarising ourselves with the equipment, finding additional funding, testing protocols, making contact with land owners and encouraging participation. This initial phase will last two years and will enable us to better plan for the future. The Bat Conservation Trust is trying out a new woodland survey protocol and we may end up using it if it seems suitable, but we are keen to get our own project underway in the meantime. 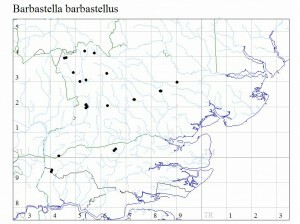 The project will therefore start with a systematic examination of barbastelle distribution with particular focus on surveying areas where we do not have records, but where we might reasonably expect them to occur. This species is readily identified using time expansion and full spectrum detectors, we have had recent success in locating them in Writtle Forest and Uttlesford and there is a wide enough geographical spread of existing records for target sites to be easily identified. The current distribution map shows records from the north and west, west of the A12, with no records from the south and east. So we will focus our initial efforts there, at sites such as Langdon Hills, Thorndon Country Park, Hadleigh Great Wood, Daws Heath, Danbury and Stour Wood. We are grateful to Essex Field Club for funding the purchase of two static detectors for the project. Further funds are being sought to purchase more static detectors which will enable us to extend the scope of this project. Nevertheless, the success of our efforts and the rate at which we can make progress will depend on Bat Group members and others getting involved. We are planning an introductory workshop for potential participants and training in use of equipment and sound analysis. Please contact Pat Hatch: woodlandbats@essexbatgroup.org if you are interested in participating in this project.